Drs. Lawrence Addleson, R. Douglas Campbell and David Landau with Art of Dentistry now welcome new patients with bleeding gums in Chula Vista, CA, for minimally invasive laser gum disease treatment. Patients with bleeding gums in Chula Vista, CA, are now welcome to visit Art of Dentistry in San Diego, CA, and receive leading laser gum disease treatment from Drs. Lawrence Addleson, R. Douglas Campbell or David Landau. Laser treatments provide patients with a minimally invasive and highly effective alternative to traditional gum surgery. There are many people with bleeding gums in Chula Vista, CA, but some of them do not realize their symptoms are indicative of gum disease. Bleeding gums are one of the most common symptoms of the disease, and typically occur after brushing, flossing or eating certain foods. Other common symptoms of gum disease include chronic bad breath, loose teeth and swollen gums. The accomplished dentists at Art of Dentistry encourage patients with these symptoms to seek treatment immediately. If left untreated, periodontal disease can lead to bone damage, tooth loss and other oral problems. Untreated periodontal disease has even been linked to conditions that seem to be completely unrelated to oral health, including stroke, heart disease and certain types of cancer. The bacteria that cause gum infection can move to the bloodstream and infect other areas of the body, potentially leading to a variety of systemic diseases and infections. To help patients manage their symptoms and achieve better oral and overall health, Drs. 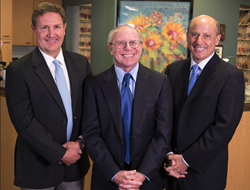 Addleson, Campbell and Landau offer laser gum surgery to patients with periodontal disease. Laser surgery is less invasive than traditional osseous gum surgery and has a high degree of success. The concentrated laser light is extremely accurate and is capable of treating diseased tissue without causing trauma to healthy tissue near the treatment site. Patients who receive laser gum surgery also benefit from a quicker recovery time with a lower chance of post-operative complications than those who receive traditional treatment methods. Drs. Addleson, Campbell and Landau encourage patients with bleeding gums in Chula Vista, CA, to schedule a consultation as soon as possible. Gum disease consultations and laser gum surgery appointments can be arranged by calling Art of Dentistry at 619-291-4325 or by visiting their website at http://www.sandiegoartofdentistry.com.